1. Preheat the oven to 200°C, gas mark 6. Mix together the Stilton and walnuts to form a coarse paste, and press firmly onto the flesh sides of the salmon fillets. Arrange the salmon in a small baking tin, skin side down, and bake for 20-25 minutes until the salmon is cooked and the topping is golden. 2. While the salmon is cooking, make the braised cabbage. Heat the oil and butter in a medium heavy-based pan until foaming, and add the garlic and cabbage. Toss together to coat in the oil and butter, then cover the pan tightly and cook over a very low heat for 15-20 minutes, stirring occasionally, until the cabbage is wilted and tender. Season and add grated nutmeg to taste. 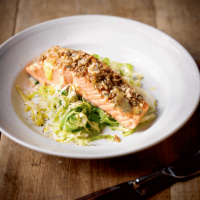 Spoon the cabbage onto plates and serve with the salmon on top.